The Kishanganga Hydroelectric Plant is part of a run-of-the-river hydroelectric scheme that is designed to divert water from the Kishanganga River (which is called Neelum River in Pakistan) to a power plant in the Jhelum River basin. It will have an installed capacity of 330 MW; its construction on the project began in 2007 and is expected to be complete in 2016. In the meanwhile, Pakistan had also started constructing the Neelum Jhelum project on the Neelum River, located in "Pakistan Occupied Kashmir", with a capacity of 969 MW. Both projects follow similar principle of design and operation i.e. to divert a portion of the water to the power station before it is discharged back into the river. 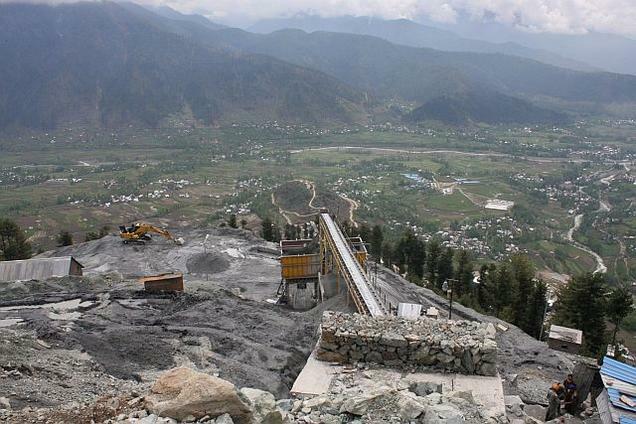 Pakistan fears that the Kishanganga Project will divert a portion of the Kishanganga water flow which will reduce power generation at the Neelum-Jhelum Hydropower Plant. The Indus Water Treaty, which regulates the use of Indus river waters by India and Pakistan, in fact allocates all Western rivers to Pakistan. India’s main argument is that all the dams constructed on Pakistan's rivers like Indus, Jhelum and Chenab so far are run-of-river hydroelectric plants, which do not apparently involve any consumption of water and, therefore, no reduction in flow of water going to Pakistan. But this does not mean that water flow is not affected. 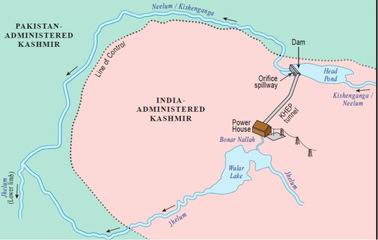 In 2010, Pakistan appealed to the International Court of Justice for resolution of the conflict under the provisions of the Indus Waters Treaty , saying that diversion violated provisions of the Indus Waters Treaty of 1965 . The Final Order came as of Dec 20, 2013 by the Permanent Court of Arbitration (PCA). The court has not only asked India to increase the environmental water flow downstream from the dam but has also ruled that all other subsequent projects cannot draw down the water level in projects below the dead storage level. But the conflict around the hydropower plant does not only occur between the two states. Local communities like the Dard-Shina tribe, said to be the last of the original Aryans living in the remote Gurez region, will be relocated to Srinagar, since there is no land in this heavily militarised region close to Line of Control (LoC). But there’s also someone saying that relocating people outside Gurez is an attempt to divide and rule the people of Gurez, which would not be a new tactic applied by the Indian authorities. Different compensation measures will also be applied. According to an article in Tehelka (see Links), Gurez tribes will be paid more because they are not only losing their land but also their culture, civilisation, and will probably become extinct in few years because of the hectic urban life. Project Details Since 2009, the hydro-electric project is being constructed by India with a planned capacity of 330 MW by diverting the waters of the Kishanganga/Neelum river through a 23-km-long tunnel. Being executed at a cost of Rs. 3,642 crore, the project is expected to be completed by 2016 . The project project involves construction of a 37 metre tall concrete dam, comprises 3 units of 110 megawatts (MW) each. Other According to Tehelka (see Links), "In addition to the various problems associated with the project, the HCC has been accused of discriminating against Kashmiri engineers and employees. The HCC authorities, locals alleged, are forcing families in the affected villages to vacate their houses and land even before providing them with compensation." Why? Explain briefly. The Permanent Court of Arbitration, on December 20, 2013, issued a judgment, on the construction of Kishanganga Hydro-electric Project (KHEP) by India. The judgment restructures and modernizes the Indus Water Treaty (IWT) between India and Pakistan. It is an effective instrument in avoiding conflicts on use of the rivers of the Indus Basin. However, the ruling do not question the project per se and leaves up to the parties to determine the compensation and rehabilitation issues. Tehelka, "Kishanganga hydel power project threatens an ancient culture"